Frank White was the elder son of Frank and Jane White of Mount Carmel Orchard, Redland Bay, Queensland. He was educated at Redland Bay State School and Brisbane Grammar School. From there he spent a decade working in the Commercial Bank. Towards the end of this time, Dad believed that the Lord was calling him to missionary service in China. He moved to Melbourne Bible Institute for two years of study. In 1939, he departed for China and service with the China Inland Mission. >With the progress of the war, Dad sought passage to Australia to serve in the defence of his own country. The British Authorities declined. He then was commissioned as an Officer in the 6th Gurkha Rifles Regiment, British Indian Army. After the war, he returned to Missionary work. He met Nurse Ella Davidson at the Borden Memorial Hospital, Lanzhou. Frank and Ella were married in 1947 at Shanghai Anglican Cathedral. Together, they served at Tsai-chai-po and at Paoning Sze, where their first child, Marion (Andrews) was born. In the years to come, Dad and Mum became the parents of Joyce (Johnston), Jane (Ganter), Barbara (Clark), Annette (Enchelmaier), Christine (Wilson) and myself. With the advance of Communist forces, they returned to Australia in 1949. After a couple of years at Mount Carmel Orchard, Dad took his growing family to Bamaga where he established animal husbandry and fruit and vegetable production. From Bamaga, Dad joined the Presbyterian Church as a Home Missionary. 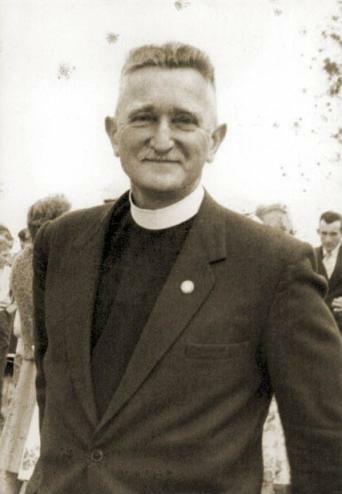 He undertook University studies prior to Theological Training, while serving at Nanango, Gatton and Bald Hills. He was Ordained and Inducted into the Charge of Miles in 1962 and subsequently served at Windsor and Devonport prior to retirement in 1977. During their retirement, Dad and Mum undertook a range of supply ministries. Dad also served a term as Moderator of the GA of PCQ. After Mums death in 1985, Dad continued to serve the Lord, but made his family aware that he looked forward to the day of his departure to be with Christ which is far better.